Make a text field for entering integers. 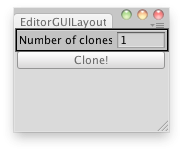 Clone the Selected object a number of times. // Editor Script that clones the selected GameObject a number of times.